Custom jewelry designs for women, men and children. Jewelry shown can be made to fit the individual. I use only the best quality in stringing materials and guarantee my jewelry for normal daily wear. Once you are ready to place an order, e-mail me with the specifics and I will send you a Paypal link for payment. Shipping and handling will be included in the final price. All orders are filled after payment is received. Semi-precious stone bracelets, necklaces, and earrings can be shipped within a week if in stock. 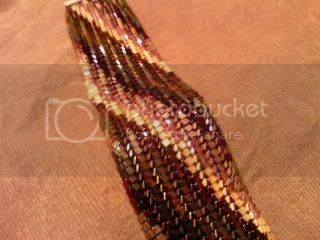 Beaded "stitch work" orders are shipped in 2-3 weeks. If you need to reach me immediately, you can EMAIL me at the link listed below. If you have any questions just let me know! Welcome to Nana's Sacred Thread. My grandchildren call me Nanny. I've been a crafter for many years, everything from painting, quilting, sewing for the grand kids and woodworking, but my heart is in beading. I have been beading for seven years for family and friends and I hope you will find something you will like. I teach beading from basics to intricate styles of small beads. You never stop learning! My designs are featured in art galleries, several stores in North Texas and exclusive private showings in Oklahoma and Texas. I have custom designed collections for professional women, weddings and other special events. I will do personal consultations for your wardrobe, special event or special gifts. Contact me on how to arrange your private consultation!